There’s no getting away from the importance of tourism in Scotland to our economy. So when did the visitor industry start? It partly started as a result of neo-classicism - the love of order and harmony that characterised what was good taste in the mid 18th-century - giving way to Romanticism. Yes, that’s pretty sweeping. But think about it. Before tourism could start, the place had to have a good image. Fortunately, the Jacobite cause had finally run out of steam, after the Battle of Culloden in 1746. The Highlands had been seen as an uncouth and wild area, where the Highland clans lived according to their own rules. To Lowlanders – Saxon folk, (or ‘Sassenachs’), Scottish or English alike – they were a threat, even a hotbed of rebellion. All this changed as major economic forces – not just the aftermath of the Jacobite campaigns – emptied the glens. The Noble Savage – in a kilt? At the same time, as part of a pan-European movement, the new spirit of the Romantics came about. Man in his natural state was considered to be uncorrupted – hang in there, I’m coming to the Scottish tourism connection. Wild nature itself was suddenly not a threat. The cult of the picturesque took root and it became fashionable to explore less ‘civilised’ parts of the world – including the Scottish Highlands. Even the Highland folk in their own costume had a cameo role at least, in the new Scotland tourism. Guidebooks and accounts of Highland excursions were available in some quantity well before the start of the 19th century. Thomas Pennant was influential, with his first Tour of Scotland 1769. The English Romantic poets showed interest. William Wordsworth, accompanied by his sister Dorothy, and by Samuel Taylor Coleridge, first visited the Trossachs (and many other places) in 1803. Dorothy Wordsworth’s Journal describes the interiors of some of the simple accommodation they found there. She often adopts a tone of patronising amusement that just makes you want to pour a bowl of porridge over her, to be honest. Some visitors get anxious about the conventions of tipping in Scotland but it’s pretty simple. Think taxis, restaurant bills and keep 10% as a figure in mind - but we also suggest situations where you don't need to tip Also, find out here what the word ‘tip’ actually means. Wait a moment, why were they all visiting the Trossachs? What is a Trossach anyway? Basically, the Trossachs are a chunk of Scotland that was the first bit of Highland scenery you reached if you set off north on horseback a couple of centuries ago. They are easy to visit if you’re based in Edinburgh. Think of the Trossachs as a beginner’s guide to the Highlands of Scotland. After the Wordsworth treatment the tourism trade there got another huge boost, thanks to the commercial sense of one of Scotland’s best-known writers. When Sir Walter Scott published his dramatic verse-narrative ‘The Lady of the Lake’ in 1810, it not only further enhanced the poet’s fame, it assured maximum publicity for the shaggy Trossachs landscape on the edge of the Highland line. It was like Rosslyn Chapel after Dan Brown’s The Da Vinci Code or even the Wallace Monument in Stirling after the Braveheart movie – just two of the other creative works that have impacted hugely on Scotland’s tourist trade – only a bit more recently. Lochs Achray and (distant) Venachar from summit of Ben Venue, Trossachs - Scotland tourism heartlands. In essence, Scott wrote a blockbuster poem and set it in a real landscape. The Lady of the Lake was constructed in six cantos and covers six days, starting with a stag hunt, right across a great swathe of Perthshire countryside which leads via Ben Ledi and Loch Venacher to Loch Katrine in the heart of the Trossachs. (Pictured here) Two of the Trossachs lochs - Achray and (distant) Venachar from the summit of Ben Venue, looking east towards Callander. It's Scotland's tourism heartland. Anyway, they read the poem and came in their droves thereafter – so that by the second half of the 19th century, the area was well served with ‘visitor facilities’ inns and coaches, railways and steamers. This, you understand, was in an age when irony, as a copywriter’s tool, was comparatively underused. In Scotland tourism terms, The Trossachs are, of course, quite nice. Don’t get me wrong. But it has always been their accessibility that has been important. The railways arrived and changed Scottish tourism for the better. The enterprising Scottish railway companies pretty soon tapped into the growing tourist market. The Caledonian Railway, with its bonny blue engines, developed Gleneagles Hotel, still a kind of traditional byword for hotel luxury in Scotland. The Glasgow and South-Western Railway went ahead with Turnberry on the Ayrshire coast, another exclusive establishment with a reputation that stretches back to the Victorians. Both have been associated with golf since their earliest days. For similar reasons, the Great North of Scotland Railway, serving the hinterland of Aberdeen, was inspired to build the massive Cruden Bay Hotel, north of the city. No, not many people have heard of that one. Though the golf course still has a great reputation, the bracing airs of this bleak coast was a hotel too far. It was demolished after World War II. Still, there has to be one exception to prove the rule. Scotland, of course, took its share of the closures and contractions of its rail network in the 1960s and some 'scenic' mileage was certainly lost that would have been a boost to Scottish tourism today. And in the other direction the likewise preserved and famously scenic Strathspey Railway runs into the area from Aviemore. Then there was the link between Stirling (actually Bridge of Allan) and Crianlarich via Lochearnhead and Glen Ogle. A rockfall finished that one off in 1965 just ahead of its 'official' closure. It was once noted for one of the finest views in Scotland possible from a railway carriage. 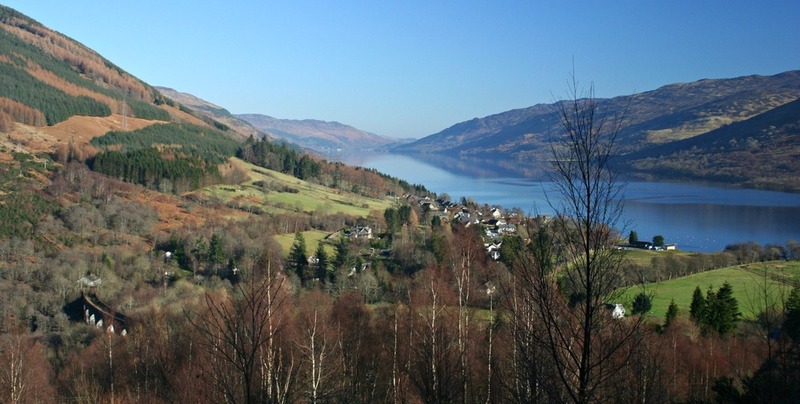 (Pictured here) Looking east down Loch Earn, over Lochearnhead. Note the viaduct bottom left. That was another rail link, from Comrie to Balquhidder, that sadly ended in 1951. The old trackbed from where this picture was taken is now a much used walk- and cycle-way in Glen Ogle. But how today's tourists would have loved that trip by train! No canter through the historical background of Scottish tourism can avoid reference to the relationship between the industrial conurbation of west Scotland - the Glasgow area - and the adjacent western seaboard. To put it simply, there were a lot of hard-working Glasgow folk who used to live only for their annual holiday somewhere on the estuary or Firth of Clyde. The great factories and mills that earned ‘the Workshop of the Western World’ label for Glasgow shut for an annual holiday called the Glasgow Fair, a high point and mass exodus in the Scotland tourism of years gone by. Everyone climbed on to steamers and invaded towns like Dunoon, Rothesay and other places down the Ayrshire coast. They went down the water – ‘Doon the Watter’. Best place of all to glimpse something of this long-vanished age is in Rothesay, on the island of Bute. They have a visitor centre on the pier that tells you all about it. Pictured here is the view from the southernmost tip of Bute, towards Arran, Holy Island and on left Ailsa Craig. A calm autumn afternoon. And, in an account of life on the island, ‘Bute and Beauty’, published in 1881, the author asks a local how they survived the winter. The answer was ‘Tatties and herring’ – that is, the plain food of coastal folk all over Scotland. And as for the summer? ‘We’re all right then: we live on the Glasgow folk’. The better-off visitors meanwhile rented houses for the whole summer season, with their men-folk joining them at the weekend. (Pictured here) Crieff, Perthshire, in winter, with Crieff Hydro, centre, above the town with woodlands behind. A historic establishment in the story of Scotland’s tourism industry. The mass trip of the Glasgow multitudes was a million miles from the elegantly consumptive patrons of Scotland’s spas, another historic thread in the story. Hotels were founded to cater for this market: the ‘Hydros’ - originally hydropthic establishments - at Peebles, Dunblane and Crieff, for instance, still prosper today, though the restrained quaffing of weird-tasting brown water is no longer on their leisure options list. At least three other Scottish places got into healthy water cures in a big way: Moffat in the south of Scotland, Bridge of Allan in the middle and Strathpeffer in the north. All, in their time, became successful spas, to where the Victorians (and even earlier generations) came for their cures. At their peak they even published weekly guest lists or broadsheets, like a kind of Facebook for hypochondriacs, so you could look up your ailing acquaintances and compare symptoms. Picture the scene in Victorian times. It’s the evening of the 11th August at Euston Station in London, England. There are several extra trains to despatch. The grouse-shooting season starts the very next day – the ‘Glorious Twelfth’. And if that sounds like a parody of the toff heading north for the season, then, yes, it is. But the importance of the shooting (and fishing) Highland estate remains to this day. Travel in upland Perthshire, Angus or Aberdeenshire in the spring and you’ll see the annual ritual of ‘muir-burn’, the columns of grey smoke rising when the heather is burned in strips and patches. The hillslopes (IMHO) look absolutely awful and it isn't great for biodiversity but the traditional burn stimulates new young growth on the heather and the young shoots provide food for red grouse, the exclusive quarry of the moors. Like it or not, blood sports are still part of Scotland’s visitor industry, aren’t they? Well, thank you for reading this far. Maybe you’re thinking of visiting Scotland. Maybe you’ll maybe need somewhere to stay. What about a hideaway country cottage...? Or somewhere for a wee romantic interlude?